There is no doubt the Glaslyn female is one remarkable lady. She deserves our grateful thanks for all the young ospreys that she and 11(98) have raised to fledging and beyond. She’s had a rough time this year, waiting alone on the nest for weeks to reunite with her long term partner. Sadly it wasn’t to be. Then along came several young males who courted her and then moved on. Nature has it’s way. 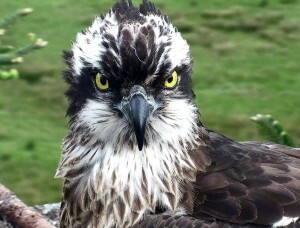 One special osprey was different though and he was still by her side today. Whether eggs are laid or not it is vitally important that these birds continue to bond. All the signs are there that they are doing just that. This evening as she waited patiently on the nest, a male osprey was feeding on a nearby platform, soon she would be delivered a fish.